At the 17th century, it was of good tone that a noble, notable or easy family has a winegrowing into of Bordeaux and makes there plant a vineyard. François de Chadirac creates his winegrowing with Vertheuil, it is famous for his Uranie novel and Lucidor, his son Jean, Conseiller with the marble table of Louis XV, succeeds to him after a tumultuous youth, and is withdrawn in Souley. The Castle knew a brilliant period at the XIXe century, because its planted vineyard of stocks centenaries and moussus, caused curiosity. 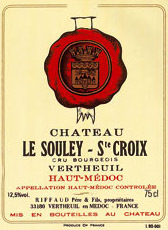 The modern history of the Château Le Souley Sainte Croix, merges with that of the Riffaud family. In 1959 whereas the winegrowing is with the abandonment, its vineyard sold with pulling up, Denise and Paul Riffaud buy it and decide to return its gloss of antan to him, because since the XVIIe century, and the first plantation, with approximately of 1616, the winegrowing knew periods of large prosperity, but also of the moments of lapse of memory. For now 50 years the very whole Riffaud family, has devoted her time, the property incomes and especially her passion inébranlable, for first of all making reappear, then to protect the winegrowing. Paul and his Jean son replanted the vineyard on a territory of 25 ha. 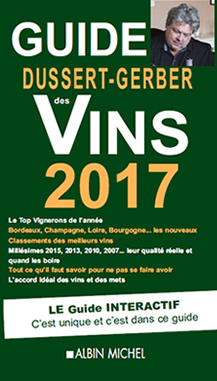 Today, Paul and Denise died, but the vineyard constitutes a powerful bond between all; Jean and his Marie-Jose wife manage the winegrowing, Frederic the oldest son occupies the function of Master of wine storehouse, Vincent, the junior has in load the material and the maintenance of the buildings, Jean-Baptiste the small last reigns as a Master on the vines. You will find this family osmosis in their wines. Souley strikes with your door. Open the all large one and let enter it, it will bead you of his vine and its wine. Do not deny that the wine is the product of a magic plant, known of the men since highest antiquity, containing substances with the unknown virtues. We are only vine growers, we know only to look after vine and wine. Remarkable Haut-Médoc 2010, of purple uby robe, fleshy, delicious, a wine which allies power and flexibility, of melted mouth where dominates the crystallized prune, of excellent evolution.